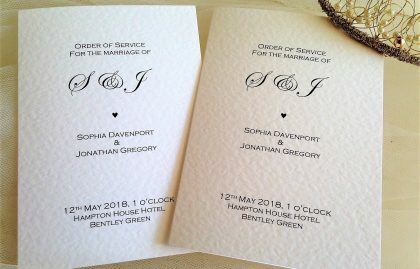 Oxford Wedding Stationery to match for the whole day. 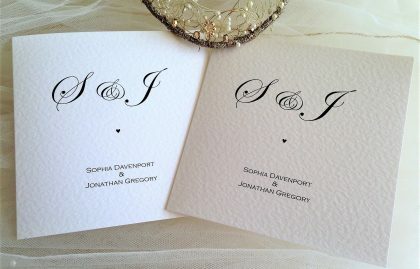 Classy, elegant invitations and wedding stationery. 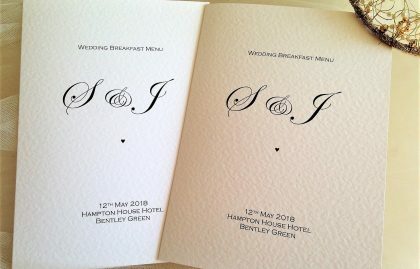 Our Oxford wedding stationery range features the bride and grooms initials in a monogram style and a small heart design. Available on white or ivory hammered card this range can also be ordered with organza or satin ribbon to add a touch of luxury. We can supply all wedding stationery items in this design so everything will match beautifully on your day. 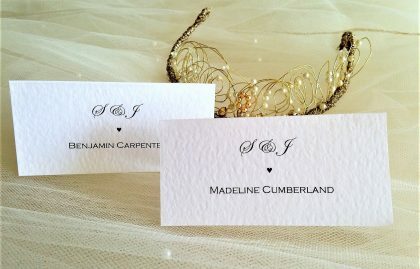 Our full range of wedding stationery items in the Oxford range include everything from save the date cards, wedding invitations, evening invitations, RSVP cards, guest information cards, place cards, table plan cards, menus, order of day cards, order of service books and thank you cards.